The Weekend My MS Went Away - BLIND FAITH LIVE!BLIND FAITH LIVE ! Real People. Real Miracles. Yet another multiple sclerosis miracle. Melissa Howell was hit hard in 2004 with MS. The diagnosis was verified by two medical centers. Melissa, a CPA, could barely function with the MS symptoms that included pain, vertigo and overall fogginess in her thinking abilities. One weekend medical treatment and healing service with Dr. Nemeh and the symptoms and large spine lesion disappeared, much to the puzzlement of her neurologist. There has been no reoccurrence of the MS in 10 years. 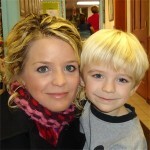 Melissa is pictured here with her youngest son, Eli, who was born after the healing. This entry was posted in Dr. Issam Nemeh, Miracle Moments, Miracle Prayer and tagged Multiple Sclerosis by Philip Keller. Bookmark the permalink. I stumbled across this podcast and listened because I have multiple sclerosis. She may have indeed experienced a miracle but this story also shows the very nature of the disease — MS can surface and retreat. This is why its called relapsing and remitting.